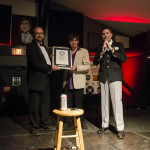 Labeled as, “The Greatest Dumbest Thing We’ve Ever Done!” The show ran non-stop at The East Room in Nashville, Tennessee, beginning Sunday, April 12, 2015 at 12:04pm with DJ Buckley and ending Monday April 20 at 4:20am with Chad Riden. The previous 80-hour record had been held by the Laugh Factory in Hollywood, CA, for a show which ran from 6 to 9 December 2010. That show included 170 different acts by 150 comedians. 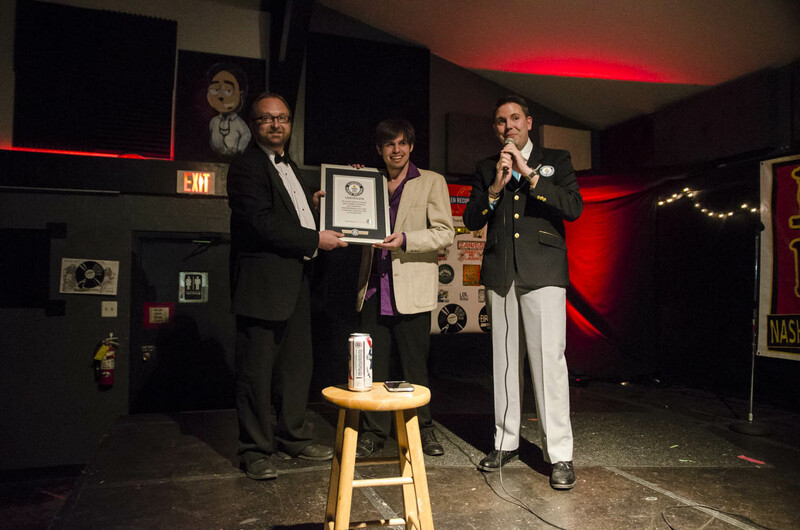 Official GUINNESS WORLD RECORDS™ adjudicator Michael Empric presents the framed certificate to Chad Riden (left) and DJ Buckley (center). The 80-hour mark was surpassed on Wednesday, April 15, 2015 at 8:04pm while DJ Buckley was performing. Official GUINNESS WORLD RECORDS™ adjudicator Michael Empric was on site to announce the new record saying, “I’m so excited to announce that with 80 hours and two minutes, you guys have set a new Guinness World Record!” The standing room only crowd at The East Room erupted into cheers, carrying co-host D.J. Buckley on their shoulders with the framed certificate from GUINNESS raised high above his head. As the crowd settled down, co-host Chad Riden performed a set, saying he did not want the show to ever end. “If we never stop, nobody can ever beat us unless they already started before we did or we die first.” The show continued through the entire duration of Nashville’s Wild West Comedy Festival, which was conducive to celebrity drop-in sets from Hannibal Buress, Rory Scovel, Al Jackson, Eric Andre, Nate Bargatze, Keith Alberstadt, Ahmed Ahmed, Killer Beaz and Jon Reep. The show finally began wrapping up Sunday night April 19th as the regularly scheduled weekly SPiFFY SQUiRREL Comedy Show presented the “Bestival of the Festival” showcase featuring stand-out performances from crowd favorites Mary Jay Berger, Brad Edwards, Carter Glascock, Monty Mitchell, Jonathan Craig, Brett Cantrell, Narado Moore, Joe Kelley and Jim Seward. After an amazing set where Narado Moore improvised unflattering impressions of lackluster out of town guest comics, the marathon show came to an end early Monday morning, April 20th with show producers DJ Buckley and Chad Riden doing their final sets. “I want to do this again next year,” said Riden. “I think we have to. I want to break our own record by five minutes just to show that we know how silly and pointless this all is.” As the official clock neared 4:20 a.m., Riden thanked show co-producers Mary Jay Berger, Ben Jones and DJ Buckley, along with Zanies Comedy Clubs’ Brian Dorfman, comedian Nate Bargatze, the Wild West Comedy Festival, Outback Concerts, the dozens of volunteers who staffed the event, the comics who performed and everybody who was in attendance to a standing ovation before hopping off stage.